ANNAPOLIS, MD (March 4, 2015) – Take a look around your local natural area. What do you see? Hopefully, there is a healthy mix of plants of diverse species and sizes. Unfortunately, many plant communities are monotypic stands (patches of just one species). Through neglect and/or poor cultural practices, these once thriving natural areas are now wastelands of non-native invasive species. The conversion of the plant community to non-natives leads to poor ecosystem health, which means less wildlife, more storm damage, and reduced habitat quality. The need for controlling non-native plants has been acknowledged for some time both by professional land managers and concerned citizens. Too often there is little opportunity in a stretched public budget to manage natural landscapes. Working together, volunteers can provide time and labor and natural resource professionals can provide training and leadership. This partnership has led to the formation of volunteer-led non-native invasive plant control projects on public lands. In recognition of this special partnership and the crucial work it enables, the establishment of Weed Warriors, volunteers dedicated to invasive plant control, has been chosen as the topic for the Invader of the Month. One of the first citizen corps was established in Montgomery County in 1999 by Carole Bergmann, Forest Ecologist with Maryland National Capital Parks and Planning, Montgomery Parks (MNCPPC-MC). Faced with budget and staffing shortages, Carole thought volunteers could be trained to ‘Save the Trees’ by pulling and clearing invasive vines and plants. Carole worked to train and organize the volunteers. Over time, a volunteer coordinator, guidelines and protocols and a web-based training program have been added. Programs similar to the Weed Warriors have now been started throughout Maryland. Each one is a little different, reflecting local interests and capacity, but each one is making a difference. Here we talk about three programs working to restore high quality native habitats to our public lands. 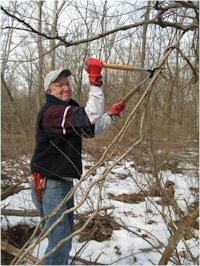 The Carroll County Weed Warriors were established by the Carroll County Forest Conservancy District Board in 2010 as a group of volunteers who remove invasive non-native plants from public lands, such as around nature centers. The Carroll County Master Gardeners and the Maryland Sierra Club-Catoctin Group partner with the Forestry Board to support the Weed Warriors. Since 2010, the volunteers have removed invasives from about 30 acres of land. In October 2013 a native plant restoration demonstration site was established at Bear Branch Nature Center. In 2014, 184 people went through the Weed Warrior training classes and other outreach efforts to learn about invasive non-native species; 219 volunteers put in 836 hours removing weeds. In October, a Volunteer Maryland employee working from Piney Run Nature Center was hired to serve as a volunteer coordinator to recruit more volunteers and to lead weeding sessions. The Carroll County Weed Warriors will have its first 2015 training session for new volunteers in April. 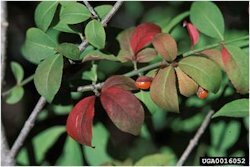 The Town of Cheverly’s efforts to combat invasives began in 2000 with Matt Salo’s work to manually remove winged burning bush (Euonymus alatus) from Euclid Woods, a 15-acre property owned by Maryland National Capital Park and Planning – Prince George’s County (MNCPPC-PG). The early years were mostly an individual effort, with other volunteers participating occasionally. The Town itself had no invasives program so local groups and individuals had to take up the slack. John Dillon and Marc Imlay, paid staff of MNCPPC-PG, have treated Japanese knotweed (Fallopia japonica) at Cheverly East Park and Euclid Woods with appropriate herbicides. In 2008, Cheverly adopted a Green Infrastructure Plan, which has a strong invasive plant removal component. The overall purpose of the plan is to preserve the natural areas of Cheverly as native ecosystems by encouraging native vegetation and biodiversity. Invasives removal requires persistence, so work continues at Euclid Woods: the list of invasives removed has gradually expanded to include multiflora rose (Rosa multiflora), oriental bittersweet (Celastrus orbiculatus), Japanese honeysuckle (Lonicera japonica) and others, resulting in the resurgence of native forbs and grasses from seed banks. Currently the woods are healthy and improving with a flourishing shrub layer and understory. In Rockville individuals have removed thousands of pounds of invasive plants. 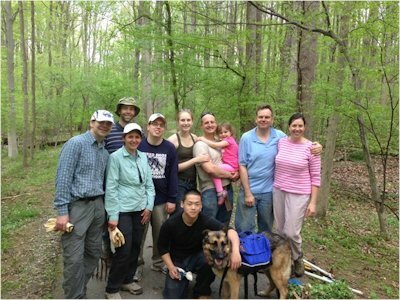 Volunteers find their way to projects via groups like Rockville’s Weed Warriors, Rock Creek Conservancy, City of Rockville, the Rockville Native Species Network, and various watershed protection groups. Volunteers work alone, or in groups, regularly or as needed, on a weekly or monthly basis. Some have regular work sites, and are able to keep “their” parcels 95% free of non-native invasive plants. One volunteer group has pulled over 9000 Japanese barberry (Berberis thunbergii) and oriental bittersweet plants. Different sponsors support specific efforts with one group interested in reducing English ivy (Hedera helix) at an historic site. Private businesses have joined in with support staff performing invasives removals at their worksites. Shannon Philbin with Rockville’s Department of Recreation and Parks and its Environmental Management Division helps volunteers secure permission to conduct invasive removals on public lands. The Croydon Creek Nature Center is one of the public land sites, where volunteers are coordinated by Nature Center Supervisor Elissa Totin. Today, weed control efforts cannot even be imagined without volunteer contributions. Last year, for instance, MNCPPC-MC Weed Warriors offered over 7000 hours of volunteer service. This is like having an additional 3.5 staff who never take sick days or vacation! These programs do not grow without the effort of dedicated volunteers like Matt, staff like Carole and Marc, and hundreds of volunteers throughout the state. Dedicated, persistent effort, working with the best knowledge of the plants, allows for real gains to be made in our effort to preserve Maryland’s biodiversity. We’re in a good place to grow the efforts of volunteer contribution to weed management in Maryland.